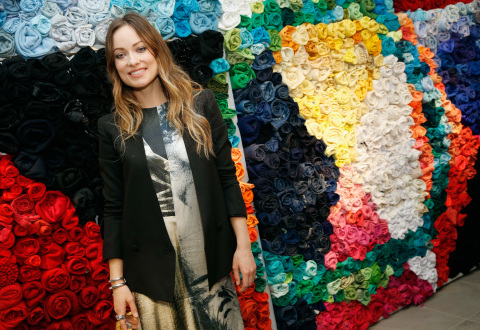 NEW YORK--(BUSINESS WIRE)--On April 4th, H&M, along with Conscious Commerce co-founders Olivia Wilde and Barbara Burchfield, hosted a preview to introduce the new H&M Conscious Exclusive collection. The event also highlighted H&M’s sustainability efforts, and ongoing global garment collecting initiative with the upcoming launch of the retailer’s first World Recycle Week campaign urging customers to join in the movement to close the loop in fashion. This is the second year that H&M has joined forces with Wilde and Burchfield to promote sustainability within the fashion industry. Wilde was the star of H&M’s 2015 Conscious Exclusive Campaign. The H&M Conscious Exclusive collection features clothing and accessories made from more sustainable materials. The collection takes inspiration from the archives of the Musée des Arts Décoratifs, located in the Palais du Louvre in Paris. New to this year’s collection are three wedding dresses, one of which was lit with fibre optics to showcase the craftsmanship and design specially created by Paris-based Korean artist Tae Gong Kim. The event also highlighted pieces made from innovative sustainable materials, such as eucalyptus bark for a pair of high fashion flats and cat-eye sunglasses made from plastic bags. Approximately 750 lbs. of recycled clothing from H&M’s global Garment Collecting initiative were repurposed and on display as art installations. Event attendees were asked to pledge to Join the Movement of H&M’s ambitious campaign to collect 1,000 tons of unwanted garments from customers during World Recycle Week (April 18-24). Garment collection bins are available in all H&M stores around the globe, year-round. “We at H&M are committed to recycling and see the future as circular. We invite our customers to join in the movement and bring their unwanted clothes to any H&M store,” says Daniel Kulle, President of H&M US. The complete H&M Conscious Exclusive collection will be available on Thursday, April 7 in 165 stores worldwide and online at hm.com. This will coincide with the opening of the H&M sponsored Musée des Arts Décoratifs' exhibition, “Fashion Forward-300 Years of Fashion.” H&M will launch their World Recycle Week initiative in stores on April 18th .Customers who recycle during World Recycle Week will receive a 30% off coupon.